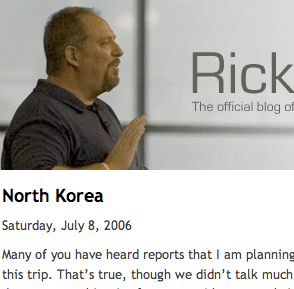 Looks like Rick Warren has entered the blog world. Check it out here. Some people (especially young bloggers and the like), enjoy bashing his methods and ministry. Personally, I think it will be great to hear the thoughts and perspective of a man who has, and will continue to have, a tremendous Kingdom impact around the world. God calls us all to different things. Regardless of style, it’s worth listening to and learning from people who are out there doing something God has called them to do. That’s wisdom worth listening to. Oh, and I have to add … you should marvel at my restraint. There was absolutely no “purpose driven” pun anywhere in this post. Previous Post You can’t do everything! cool link, seems like your blog exclusion was purpose driven.